Reigning champions Nigeria hammered Australia 6-0 to reach the Under-17 World Cup quarter-finals and set up a meeting with Brazil. Victor Osimhen scored a hat-trick, which included a penalty, to continue his impressive form in the tournament. Kelechi Nwakali, Edidiong Michael Essien and Samuel Chukwueze scored the other goals for the Golden Eaglets. 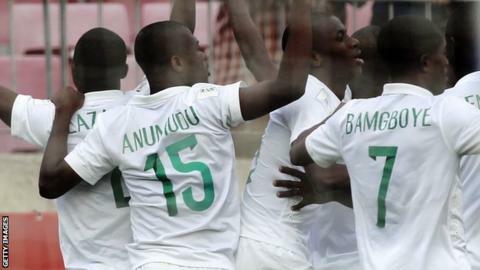 "Victor had a great game, although the philosophy is to play collectively," said Nigeria coach Emmanuel Amuneke. "We are candidates to win the title, but so are Brazil. We will work to put up a good fight." Brazil edged past New Zealand, securing a 1-0 win with the last kick of their game - a penalty converted in the 6th minute of stoppage time. Nigeria and Brazil will meet for their quarter-final in Vina del Mar on 1 November.